Fergal McCarthy: Is Irish art on the Money? Is Irish art on the Money? Gemma Tipton wrote an article in the Irish Times on Saturday June 11 in relation to the lack of interest in the recession by Irish visual artists. Liffeytown gets a mention towards the end of the piece. WHEN ERNEST Nicol’s 1862 oil painting, Insolvent , was auctioned at Adam’s earlier this month, the result was surprising. It’s a sentimentalised scene of a man fumbling in what appear to be empty pockets, facing a woman behind a counter who is clearly not inclined to extend him any credit. It’s not terribly brilliant, and it fetched €36,000. The main reason the sale raised eyebrows was that the painting had been purchased for a fifth of that amount less than two months previously at an auction in the UK. It’s a quirk of the art world that in an international market, with instant global communications, you can still turn a profit by buying a painting in one country and selling it in another. What is striking about this sale, though, is the demand it reveals in Ireland for art that makes a connection with our economic situation. Nevertheless, go looking in Irish museums and galleries of contemporary art, and you’d be hard-pressed to find artists addressing the collapse of the banking system and the economic downturn. The recession has emerged as a, for want of a better word, rich theme in drama, literature and music, but why have Ireland’s artists been so slow to take it on? One reason for this is art’s departure, since Modernism, from the literal and representational. Another is the way art is made and funded: in the past artists needed either private funds or a patron to make work; today they need collectors, grants, or both. This also explains why we have stronger literary and musical traditions in Ireland than we do visual. Even in Nicol’s time, representations of extreme poverty were rare in fine art: it’s not always a good idea to remind people with money of the inequities of wealth when you’re trying to sell to them. A Scotsman by birth, Nicol moved to Co Westmeath in the mid-19th century and depictions of post-Famine misery became his stock-in-trade. In much the same way as Angela’s Ashes made misery-lit fashionable, poverty was a picturesque subject for Nicol. While the Famine was visually expressed by political cartoonists, it was largely avoided by artists here. Catherine Marshall, author of several books about Irish art, has written that this was because of a perception “that such work would not be acceptable to the establishment”. She cites RG Kelly’s painting An Ejectment in Ireland (1853), which was even discussed in the House of Commons. So, is something similar happening in art today, and should artists change their practice to reflect what is happening in society? In the unequal society of 19th-century Ireland, patronage was vital for an artist, but surely their 21st-century counterparts enjoy a greater freedom of choice in terms of subject matter and expression? Of course they do – to a degree. Nevertheless, the art that survives today to become tomorrow’s art history is that which is collected. And collectors, and the private galleries operating the system that brings artists to the attention of collectors, are driven by an understanding of what will sell. The price of art, what is perceived to be its value, is consensual. The art writer and critic Robert Hughes says, “Art prices are determined by the meeting of real or induced scarcity, with pure, irrational desire.” In a gallery, the price is derived from a complex mixture of values, which include previous prices the artist’s work has fetched, who has collected it, where it has been exhibited and even the prices of the work of other artists represented by the gallery. Perhaps then it’s no wonder that artists are not only slow to make work that comments on the recession, but that few commented overtly on the boom either. Apart from the volume of average work that flooded the market, the boom’s most obvious effect on art was seen in the work of its most famous cheerleaders, Jeff Koons and Damien Hirst. Koons’ large, shiny, vacuous objects – such as his Hanging Heart, Magenta and Gold , which was auctioned in 2007 to the Qatari royal family for $23.6 million (about €16 million) – became icons of an over-hyped market. Two years later, his Violet Hanging Heart made “just” $11 million (€7.5 million) at auction. IN IRELAND, the obvious artistic beneficiaries of the boom were those whose work adorned the walls of corporations. Large-scale abstraction by artists such as Corban Walker, Michael Warren, Sean Scully, Ciaran Lennon, Patrick Scott, Anne Madden and Louis le Brocquy became the perfect foil for the austere modernism of Scott Tallon Walker buildings, creating a corporate visual language of contemporary art. Artists who took on the more problematic aspects of all that money included Colin Darke, whose Capital project consisted of the three volumes of Karl Marx’s Das Kapital being inscribed, in its English translation, on to the surfaces of 480 otherwise throw-away scraps of paper, used boxes and packaging. Capital was exhibited at the 2003 Venice Biennale, and at Context Gallery, Derry, in 2005. The main commentary on the excesses of the first years of this century, however, came from artists working outside the gallery system, whose work could not necessarily be bought and sold. In 2007 Seamus Nolan’s Hotel Ballymun put a temporary chic hotel into one of Ballymun’s condemned tower blocks, an idea previously seen in 2003 at Hotel Neustadt , in Halle Neustadt, Germany. Hotel Ballymun drew attention to the exotic nature of poverty, creating a sense of ambivalence in those, so to speak, on safari for their overnight stay in the hotel. Kennedy Browne (the collaborative practice of Gareth Kennedy and Sarah Browne) and Sean Lynch also made work commenting on the boom, so it’s no surprise these artists also have something to say about the bust. Kennedy Browne’s How Capital Moves , which was on show in Limerick in May, examined the relocation of a fictional company (based on Dell) from Limerick to LA, reflecting both artists’ continuing interest in themes of value, capital and commodities. Tom Molloy’s interest in the boom has also translated into work addressing the bust. A series of pieces, made from 1999 on, took the US dollar bill and turned it into artworks. In Map, Molloy cut the outline of a map of the world into a single dollar and framed it. This not only raised the value of the dollar from its unit of currency to a work of art, it also provided a commentary on the influence US dollars have on the world economy. More recently, with Framework No 1 (2008), Molloy created a collage with a cut-out from a dollar bill placed on to a Chinese 100-yen note, the ghostly outline of the remains of the dollar reflecting the change in financial world order. Molloy’s Somewhere (2009) is a more subtle comment still, as Molloy transcribes the music and lyrics of Somewhere Over the Rainbow , from The Wonderful Wizard of Oz. As well as a perennial entertainment, The Wonderful Wizard of Oz was an allegory of banking, finance, commerce and industry, with Dorothy and her companions: the Scarecrow, representing midwestern farmers; Tin Man, as the industrial urban worker; and the Cowardly Lion, representing the populist leaders of the time, following the yellow-brick road (the gold standard) that leads to nowhere. Another icon of the past has also recently reappeared to illustrate our mixed feelings about the world we live in today. Grace Weir, Duncan Campbell and Sean Lynch have all put the DeLorean DMC-12 into their work in recent years, and what better symbol of ambition, greed, belief and hubris than the silver, gull-winged beast that was meant to transform the fortunes of Dunmurray, in Belfast, but which ended instead with bankruptcy, corruption, recrimination and arrest? At the Royal Hibernian Academy Annual Exhibition, which runs until July 30th, the commentaries on the bust are all photographic. If the aesthetics of the boom were a glittering, brightly coloured emptiness, works by Anthony Haughey, Eilís O’Connell, Mary Kelly, Jerry Huysmans and Enda Cavanagh show the look of the bust to be one of high-gloss, panoramic decay. Most of the Irish art examining the recession is, perhaps not unnaturally, fixated on property. Brian Maguire’s recent exhibition, Notes on 14 Paintings, included stunning paintings of an apartment block and Contemporary Ruin , a half-finished corporate headquarters. 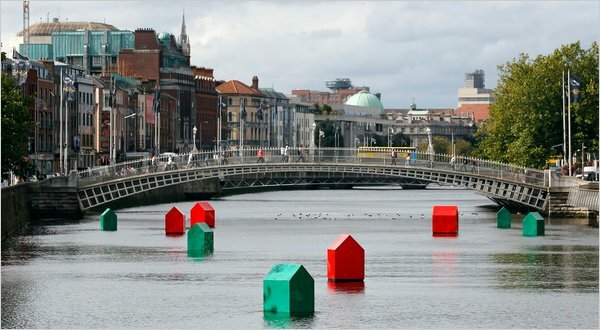 For Fergal McCarthy’s Liffeytown (2010) the artist placed oversized Monopoly houses and hotels into the River Liffey as a symbol of the property game that brought Ireland to its knees. The recession changes how we see some work. Martina Galvin’s photographs of Aldborough House were taken at a time when the house was to be redeveloped, but the hindsight of what happened next casts them in a new light. It has also changed how some artists relate to their own work. Corban Walker describes his installation at this year’s Irish Pavilion at the Venice Biennale as a response to the collapse of world economic order, but it is perhaps more accurate to see it as an extension of his investigations into our relationship with scale and the structure of things. In the complicated dance between art and money, references to the recession, particularly among artists who depend on sales, will remain oblique. But unless more artists find new ways to respond to it, it’s hard to know what the visual record of our present preoccupations may be.